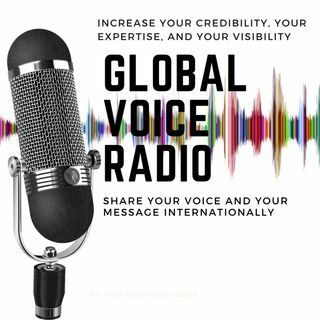 Whether you are a coach, author, speaker, business owner or entrepreneur, Global Voice Radio is ready to help you be heard, be seen, be visible, globally. Roxanne Derhodge is the host of Authentic Living with Roxanne. Roxanne provides an empowering and supportive space for everyone to listen and engage in thought provoking conversations about everyday life with real people who have a passion for living life to the fullest. Authentic Living with Roxanne is the catalyst for transforming ... See More your life!! Creating "A World of Women of Significance" is what host Margie O'Kane is doing. Margie's vision is to create a global movement of 1 million women to become women of significance. This entails women accepting their true essence of empowerment, strength, and value. Margie's mission, and her show, is to ... See More equip women to spend the next 10, 15, 20 years being an inspiration to themselves, their families and their communities. Women who want to give more and share their stories, wisdom and skill. To create their Masterpiece, I teach them to see their own true worth and believe in themselves and to be an inspiration to the next generation of women and girls. Margie's WHY is to leave our (my) world a better place. Margie wants people to feel better because they have met her. Margie wants to inspire/encourage woman to find themselves and live a life complete. A life complete in whatever way that means to them. Margie O'Kane lives in Melborne, Victoria, Australia with her husband, close to her children and grandchildren. Connect with Margie on FB at www.facebook.com/margie.okane. "Don’t Wait ‘Til Pigs Fly", with host Nancy Becher, is the rallying call for entrepreneurs who are serious about growing their businesses, but don’t want to go it alone. Too often not knowing what steps to take, or what decisions to make, holds the business owner from moving ahead. You know you want to share your passion with ... See More the world. You Want To Be Your Own Boss and have the money to do the things you dream of doing. But there’s the Fear Factor. Where do you turn? Who do you ask? The purpose of my weekly show is to fill the void. I, and my guests, will provide suggestions, strategies and processes designed to grow revenue in your business. I am here to answer your questions, provide you with guidance and support. When you take action now and don’t wait 'til pigs fly, your business will soar. Nancy Becher dreams of a world that runs on the vibrancy of thousands of small businesses, all working together, making money and living in great supportive communities. As a journalist and business consultant for more than 30 years, she has worked with hundreds of companies, large and small (throughout the United States and internationally), helping them create strategies and processes that are built to give them more revenues, less stress and raving fans. While knowing that starting and growing a business is hard work, she also believes that there needs to be fun involved and her approach to helping others is to share with them the concept of not waiting “till pigs fly” to get out there and get started. Her first book “Baby Steps to Starting (and Running) Your Own Business” will be published in 2018. Practical tips and techniques can be found on her website at www.nancybecherbiz.com. Broadcasting from Global Voice Radio every week on Fridays at 3 pm EST and now here are your co-hosts Irene Coffee and Karen Wine. Living From the Inside Out is about living fully, guided from YOUR inside. Holly Wade shares the wisdom of how your mind, body, and spirit truly are connected. You, deep down, truly know your answers. Holly and her guests, will provide tips, practices, and inspirational stories to help you approach your life from your own heart. During his show, MIND BODY LIFE founder and bestselling author Frederick Entenmann investigates the little-known insights and daily methods to create explosive life transformations and transitions with those that have risen from struggle and ascended to greatness, to live a remarkable and harmonized life beyond their imagination. Mindful Moments with Maree is hosted by Maree Jane Duffy, from Ireleand. Maree is an Intuitive Healer & Spiritual Coach and she will be reaching out to women discussing topics regarding life, relationships, happiness, meditation and getting in touch with their true self and their purpose. Maree will also share a meditation each ... See More week as she helps women discover the benefits of meditation. Listeners are encouraged to "Ask Maree Anything" not like an "agony aunt" but a little more deeper and compassionate. Mindful Moments with Maree is an inner & closer look at ourselves and becoming more mindful in our lives moving forward. Maree will also discuss how her sessions with people which are called "Life Road Maps" help people overcome blocks and places they are stuck in their lives. In this inaugural episode, William D. Burton, the “Motivational Minstrel”, and Denise Joy Thompson, CEO, Global Voice Radio discuss how William moved past trauma and a “bad decision” to becoming a motivational speaker and teacher within the community and within the prison setting. William shares his motivating, personally-written and ... See More composed music. William discusses his Sustainable Life Skills teachings and Tapping into the Intelligence Power of Subconscious Mind! The “Motivational Minstrel” with host William D. Burton will air on Global Voice Radio at on Thursdays, 8pm Eastern. NYA’s Project with host Nikki Ruffin-Smith emerged from the experience and gap Nikki, and other women and girls face, regarding education, training and encouragement of excelling and becoming leaders in the field of STEM-A, Science, Technology, Engineering, Mathematics and the Arts. Nikki has created and authored books, workbooks, and ... See More entire curriculums for parents and educators to use to ensure all children, though specifically “girls of color” (Nikki’s words) to be introduced to and supported in the STEM-A fields. Nikki, from growing up in Selma, Alabama, learned first- hand the inequities of education due to race and socio-economic status. Nkki brings her heart-centered perspective, her love of children and education to her show. Nikki will also be intertwining tips of building a business and ensuring there is fun along one’s journey. Nikki will format her show with solo shows and guest interviews and discussions. Guests will include STEM-A educators/advocates, parents, and interested constituents. Discussions will include current projects, how we are supporting the STEM-A effort, what are the current demands/trends, where do we see our STEM-A world in the near future, and how Art makes the effort OR does it break the effort. Only the Best for You shows you how to be a changemaker in our complicated world, while bringing out the best of yourself. Be a changemaker. Your host Carol Davies will help you unlock the secret to limitless confidence inside you and create the career, relationships, dreams, and impact on the world you want. Carol and her guests will ... See More show you easy techniques to find your true purpose and passion in life, as well as how to manage your life joyously and successfully. The Author's Message. The earliest written communication was the beginning of the technological communication we engage in today; ironic we are using symbols (emojis) in so much of our written communication today!!. Since that time, people have been trying to share their "Mess" in a way which is understood, turning their ... See More 'Mess" into a message. The "Author" engages in human communication through language, words and symbols. There are more "authors" today than ever before, published and unpublished; messages received, understood or even misunderstood. The Author's Message will explore the world of authorship, writing, publishing and the "Mess"age. Guests will include authors, publishers and readers. Vickie knows “Boomers” have the best years ahead of them and she will explore all that is unique in the life of Boomers. Time, change, loss, kids, parents, work, retirement, travel, health, fitness, LIFE! Vickie, and her guests, will delve into self-development, relationship, emotional and physical aspects of being 60 and beyond!! ... See More Vickie will share her own journey of the “Golden” years, how she is creating a Vibrant Life and how you can have the best of your Vibrant Life too!! Hannah Edwards, the host of The Roller-coaster Ride of Business, is the owner and founder of Empowered Virtual Assistants and provides business solutions and services to ensure business owners and entrepreneurs are able to focus on revenue generating activities and for their systems to be efficient and effective!! Hannah has also created an international-focused magazine, Empowered Business Magazine which provides insight into the creation and building of businesses. Hannah asks her contributors to be raw and vulnerable in sharing their "Ride on the Roller-coaster. Hannah .lives in the United Kingdom near London and serves clients around the world. Contact Hannah at Empoweredvauk@gmail.com. In “Your Creative Force”, Avianne connects the listener to awareness and strategy with regard to their deeper, uniquely creative self. When you learn to apply your Creative Force to business or entrepreneurship, or any area of your life for that matter, you will know how to align your goals with your values and have healthy boundaries at ... See More the same time. You will also know how to authentically live your potential in a way that actually works for you and not against you. Avianne puts words and actions to the individual desire for meaning, significance and fulfillment via sharing her own Truth and (in some shows) interviewing others about their success, derived from tapping into their own Creative Force. The secrets of knowing who we truly are and how to unearth our individual treasures to manifest them into reality, are locked away inside each person’s Creative Force. Avianne firmly believes that the uniqueness and creativity that naturally occur within each person hold the keys to unlocking our full potential for success in every aspect of our lives This is not something we have to strive for, but something we need to learn to be consciously aware of, steering us toward what we really wish to accomplish in our lives. And it truly does apply to everything we wish to pursue. This show, in practical and doable steps, will reveal to the listener firstly what (often unknown) creative power is truly carried inside their humanity, secondly how to access that creative potential and thirdly how to weave that creative power and potential into an everyday life of self-actualization and empowerment of not only self, but of every person in every sphere we encounter in society, both in our personal and business capacities. Avianne also offers customized coaching and creativity courses to business people that will accelerate the journey within to manifest our desired outcomes in the real world. Your Global Voice -- International Women's Month is a special series of 31 interviews with women from around the world. This series was created for March 2018 in recognition of Women's History Month, celebrated in the US and of International Women's Day sponsored by the UN and celebrated on March 8. The world today is ... See More changing rapidly and women's right, human rights, are at the forefront of the political-socioeconomic challenges facing every country today. Women's voices are the catalyst for change. The women sharing their messages, their stories do so to empower, encourage, inspire and motivate others to step up, stand out and take action to create a world of equality for everyone. These women said Yes, to be seen and be heard. Many countries are represented through these voices: Australia, Canada, England, Iran, Ireland, Cameroon, Kenya, Pakistan, Slovenia, United States and more.